Even style-conscious moms get into fashion funks. Five hours of broken sleep, mountains of dirty laundry, and the daily dash out the door usually ends up with us in the easiest outfit we can reach for. Gone are the days of outfit planning and having an hour in the morning to style together the perfect ensemble. But today we're going to change all that with an easy solution to rejuvenate our favorite printed pieces and inject fresh style into our everyday mom outfits. Mixing prints! You don't need to be a celebrity stylist to pair multiple prints in one look. By keeping these styling tips for mixing prints in mind, you'll be the most fashionable mom at the park in no time. 1. Mix two different sized prints. An easy option? One large-dot print + one-pin dot print. Mixing print scales provides depth to an ensemble and is always flattering to the eye. 2. Find one common color between the two prints or have one of the prints entirely neutral. A similar color or neutral combo print allows for the prints to live in harmony instead of fighting each other for attention. 3. Soft + structured print combinations are an awesome style formula. Leopard print + stripes or florals + dots, these soft + structured combos provide balance within the outfit and prevent a run-on sentence of the same print. 4. Break up the two prints with a solid item. In today's outfit, it's a solid utility jacket and dark-rinse skinny denim. 5. Accessories are a print mixer's best friend. Scarves, flats, and tote bags are easy ways to add an extra pattern to your everyday mom style. For yours truly, this floral number I've styled today is something I've been counting the days to wear this spring. 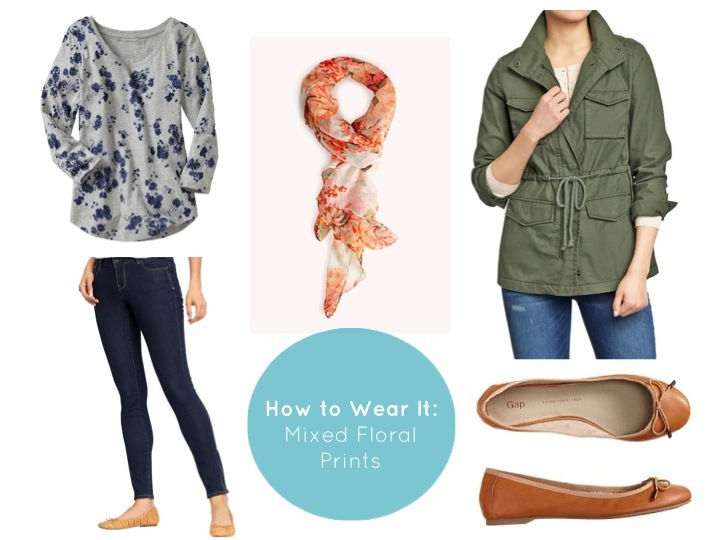 I adore the pairing of the soft floral tee and the coral hue of the garden scarf with my everyday mom staples—dark skinny jeans, a utility jacket, and ballet flats. From daycare drop-off to a day at the office and a lunch date at the ferry building in between, this lovely look will make me feel cool, comfortable, and as fashionable as my pre-baby days. 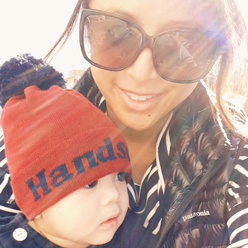 A winning mom style formula all around! What prints are you excited to pair together this spring?